This month I'm welcoming a familiar face back to T.O. & fro! Batty's Bath is a botanical skin care and soap company based in southern Ontario and every. single. product. is lovingly hand-crafted using planet-friendly, people-friendly and animal-friendly ingredients. My sister-in-law and I have been using Batty's Bath products for 8 months now and continue to see results of the shift from the store bought lotions and potions to Batty's all natural products. One of my new favourite products that I have recently started using is Batty's mineral cream concealer. In a nutshell, this wonderful addition to my makeup routine is 100% natural, won't clog pores, is safe for acne prone and sensitive skin, contains light sun blocking ingredients and is conditioning and moisturizing. Batty claims this concealer provides medium to full coverage, and she is spot on. Finding a full coverage concealer has been tough for me, so when I came across this product, I knew I had to try it. This girl can have serious dark circles some mornings. However, since shaking up my makeup routine with this product, I have not had to worry about walking into work looking like a zombie... the dark circles are gone. While the concealer is thick, it applies smoothly and evenly, and does not leave the areas applied feeling dry. Another great thing about it is that it lasts throughout the day, I don't have to worry about reapplying. Application is easy. After washing my face, I apply Batty's Bath facial primer & daily detox moisturizer. Next, with a concealer brush or clean finger, I gently apply the concealer under my eyes and on other facial problem areas. After applying concealer, simply continue your makeup routine with a foundation and/or finishing powder and you are ready for the day. Only a little is needed per application, so the entire jar will last you a few months. 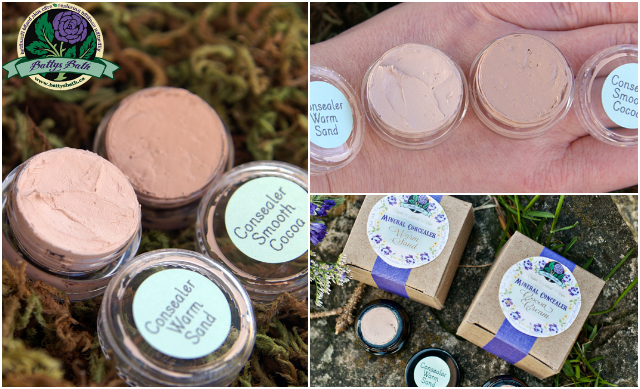 The concealer comes in two shades: warm sand (light) and cocoa cream (medium), and is vegetarian and cruelty free (but not vegan - it does contain beeswax, which is sourced from local, ethical beekeepers). Batty's mineral makeup doesn't stop at concealer. Make sure to check out the other products in her makeup line, including the newly released lip colour and mascara. Interested in trying some of Batty's Bath skin care products? Sign up for the Batty's Bath newsletter to receive a free shipping code! Or, start shopping here to receive 15% off your first order. Stay tuned for her North American free shipping day on March 20, 2015. *This is a sponsored post, however, I truly believe in this shop/product or else I would not share. All opinions are 100% my own. This post does contain a referral link. Your continued support of T.O. & fro and sponsors is greatly appreciated! This stuff sounds really interesting! I might just have to try it out! ummmm, are you reading my mind lately? I am all about mineral products right now and have been on a search for something good! I am gonna check this out for sure.